What Thermal Energy AbsorberTM (TEA) is? The Earth receives 174 petawatts (PW) of incoming solar radiation at the upper atmosphere. Approximately 30% is reflected back to space while the rest is absorbed by clouds, oceans and land masses. The sun provides planet earth with more energy each hour than human civilization uses over a whole year. The earth absorbs 50% of the sun’s energy and stores it as heat underground. The temperature remains constant at a point of 42 °F to 100 °F all year round depending on where you live on earth. Many colder countries consume more energy for heating than electrical power. The solution is Thermal Energy Absorber (TEA). TEA is an integral part of Hybrid Geothermal system uses to capture surplus heat from sun in summer or heat energy extracted to cool the building which will be stores in the Geothermal Reservoir in the ground to increase its temperature. This allows a large volume of Geothermal ReservoirTM to achieve significantly higher temperature which can be maintained over the fall and heat will be recycled back to the building in winter to provide heating– this permits natural heating of the building at a fraction of the cost without burning fossil fuels. 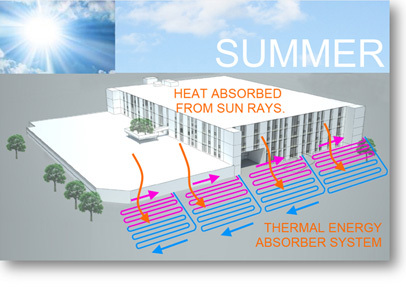 Thermal Energy AbsorberTM collects sun heat using fluid circulating through an array of pipes embedded in the surface of the outdoor parking, roof or school playground and stores it in Geothermal ReservoirTM in the ground and releases it to heat buildings in winter. How Thermal Energy AbsorberTM Works? TEA System uses thermal fluid which is mixture of water and antifreeze circulates through an array of ¾” pipes horizontally embedded in the surface of the outdoor parking, school playground or building fabric such as roof to absorb sun heat or when outdoor air temperatures are high in a day or in summer and effectively store it in Geothermal Reservoir. Energy Efficiencies & Low Carbon Foot Print. By comparing traditional geothermal field, the TEA system works as an integral part of Hybrid Geothermal increases the Coefficient of Performance (COP) of Central Water to Water heat pumps or distributed heat pumps by 25% and significantly reduces carbon emissions when system operates in winter.